Could a few seconds of warning be enough to mitigate the devastation of an impending earthquake? Tiny sensors being developed in a Simon Fraser University lab could help to give a pre-emptive head's up, enough to secure critical infrastructure, such as bridges or power lines, and potentially save lives. Researchers in professor Behraad Bahreyni's Intelligent Sensing Laboratory at SFU's Surrey campus are creating ultra-sensitive accelerometers—tiny microsystems (less than 1cm2) that are capable of capturing the most sensitive seismic activities. "When an earthquake happens, its sound, in the form of seismic pressure waves, travels faster than the destructive land motions," explains Bahrenyi. "The sensitivity of these devices is such that they can pick up the pressure waves produced by an earthquake before it strikes. This could impact the outcome of such a disaster." Bahrenyi says the high cost of existing seismic sensors limits their application to very few locations, attached to the main pieces of infrastructure. "A few seconds to minutes of heads-up warning to the public could drastically reduce the negative impact of an earthquake, both in terms of saving lives and also protecting infrastructure." Bahreyni's lab began developing its accelerometers as a solution to making underwater sonar systems more compact and cost-efficient. The researchers collaborated with Halifax-based Ultra Electronics Maritimes Systems, which provided funding to develop sonar systems for underwater threat detection with improved defense and security abilities. "We sought to develop cheaper, more compact products that would meet strict performance requirements and which could also determine the direction as well as the amplitude of sound waves," says Bahreyni, an associate professor in SFU's School of Mechatronic Systems Engineering (MSE). For the past two decades he has developed sensors and sensing systems for both academia and industry. Bahreyni soon realized that the high-performance, micro-machined accelerometers being tested and developed in his lab could have additional applications in detecting sound waves. This applies to the low-frequency seismic pressure signals from earthquakes, or high-frequency vibration patterns along pipelines, caused by minute sounds from gas leaks. The research has led to a start-up company, axSense Technologies, which received the BC Tech Association prize in the 2017 BC Innovation Council's New Ventures technology competition. The devices made by Bahreyni's group measure how tiny 'seismic mass' made of silicon is displaced, due to external vibrations, using precise electronics. The numbers are mind-boggling: at its limit the sensor measures seismic mass displacements in the order of 1/10,000th of the diameter of a hydrogen atom. The sensor can detect the sound of a whale calling from 60 miles away. To realize the seismic mass and the setup to sense its displacements, the group is using the advanced microfabrication facilities at SFU's 4D LABS. 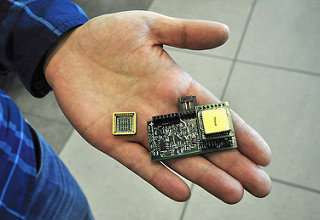 The company's accelerometers have a noise level 20 times better than what is currently available, and a bandwidth four times better than current products. Bahreyni is confident that the first-of-its-kind performance metrics attributed to these accelerometers have the potential to make axSense, and its various applications, a market leader. The SFU lab is considered Canada's leading research laboratory focusing on materials, devices and systems for various sensing applications. Bahreyni says reaching such high-performance levels has required precision design, and optimization of process and system at all levels, from materials to signal processing. "We had to develop new methods, just to test the devices," he notes. Typical accelerometers measure down to the "milli-g range." Bahreyni says while that's more than enough for day to day applications, it's far from what is needed to adequately pick up a sound signal, noting his accelerometers measure about "a thousand times" better than the average device. He credits his student team for contributing strong mechanical, electronic, and design skills to designing and testing devices. The lab's team, which includes post-doctoral researcher Soheil Azimi and Fatemeh Edalatfar, is also working to create solutions for human-robot interface, including sensors to help robots see and follow humans without the need for video cameras, nano-devices for environmental monitoring, and machine learning techniques to improve sensor signals. Bahreyni, who has authored more than 100 technical publications and has five patents, says his lab continues to advance research with industry partners in automotive, defense and telecommunications sectors. He expects to market his accelerometers over the next few years.